As part of Book Blogger Appreciation Week we were given the opportunity to opt in for interviews, meaning being paired up with another blogger who has a similar taste or blog style to you. I was a little unsure about joining up for the interviews at first, but I'm so glad to have opted in. I was paired with Trish from Love, Laughter and a Touch of Insanity and have thoroughly enjoyed getting to know her through both email and her blog. I wasn't aware of Trish's blog prior to this but am glad to have discovered it. Not only does Trish share all things bookish, she also has a variety of other content including chronicling mummyhood, sharing craft activities and much more. Trish's blog is very much an all rounder, and Trish herself is just wonderful! Go check her out!! I wasn't too sure how to proceed with the whole interview element, given that this is my first BBAW, but a Q&A format suited us both perfectly. I asked ten questions, all bookish but drawing influence from some of Trish's own interests, and she supplied some great answers. We introduced ourselves yesterday, but could you tell us about yourself / your life using only a book title? (It doesn't have to be a book you've read). One Flew Over the Cuckcoo's Nest? Ha! Life with three kids 4 and under gets crazy pretty quickly. I live in Dallas, Texas and am currently staying at home with the new baby. I've always loved to read and try to squeeze in books, amongst all the other things, as often as possible. Speaking of books read, what was the last book you read - tell us a bit about it. I've been reading a lot of comics this month for #ComicsFebruary, but the last regular book I read was The Girl with All the Gifts by M.R. Carey. It takes place in post-apocalyptic London where "hungries" (zombies) have overrun the population. Melanie, a child who has grown up on a army base, slowly discovers just why she and a group of kids have been living such a sequestered life. It was a book that was truly difficult for me to put down! It had a great mixture of mystery and heart and I highly recommend it! (Zombies and post-apocalypse are not usually my thing, but it really worked well in this book). What was the last five star book you read and why did it receive that rating? Five star books don't come along often for me--maybe one every other year. I think that's because I'm really particular about what makes a book a five star read. It really has to speak to my soul to earn those stars! The last one was Tiny Beautiful Things by Cheryl Strayed. It's a collection of advice letters from The Rumpus's Dear Sugar column. The way that Strayed speaks about life really hit home for me and there were many times when I clutched the book to my chest just sobbing. That's what makes a five star book for me! Do you have an all time favourite read? I often joke that Wuthering Heights is my favorite read--really it's just the book that acted as a gateway drug for literature. If I had to choose one all-time favorite read, it would be Extremely Loud and Incredibly Close by Jonathan Safran Foer. Such a beautiful and emotional book! In the same vein, do you have a favourite book to movie adaptation? I recently watched Still Alice and that's now my favourite. I need to read Still Alice! My absolute favorite movie adapted from a book is The Princess Bride, but I haven't read the book!! I keep meaning to, but I'm afraid that it will fall flat after having watched the movie so many times since I was a child. Recently, though, I really loved The Martian--it's one of the rare cases where I like the movie more than the book. Do you have a reading comfort zone? A preferred genre, author, theme/element etc. My reading tends to be all over the place. Fiction, nonfiction--this month I'm focusing solely on graphic novels and comics. I've really come to love Stephen King over the past couple of years--it seems ironic to call him a comfort read, but I've come to feel at home when I'm reading his books. I love the way that he builds his characters and worlds. But I'm definitely not a horror fan! An element I greatly enjoy when it comes to reading is travel and escapism, have you ever added a destination to your travel bucket list after reading about it in a fictional book? Being a mummy, I have a list as long as my arm of books I'd like to one day share with my son, do you have any childhood books that you'd like to share with your beautiful girls one day? Yes! My oldest is almost five and I've wondered if she's old enough to read through a longer book over the course of a few weeks or if her attention would wane. I can't wait to read Alice in Wonderland, Peter Pan, The Secret Garden--and I was thinking we might start with Mary Poppins. We read stories every night before bed, so books is definitely part of our daily routine. I know that you like to craft, have you ever completed a bookish craft? If so, do you have a favourite? Other than making the odd bookmark here and there, no bookish crafts. I do love crafts so I think I need to figure out how to incorporate the two. 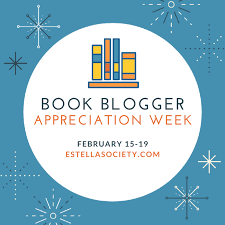 Lastly, why did you sign up for Book Blogger Appreciation Week? One of my very favorite things about blogging has always been the community. Over the years I've connected and met so many awesome people--some I've met in person and some that I've been friends with for years. While in the past this week has been tied to blogging awards, I love that it's now just a great gushing appreciation for other bloggers. Plus it's a great way to connect with other bloggers! The community has gotten so big that events like this help make it feel a little smaller. 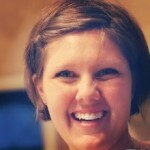 Feel free to go and show Trish some love on her blog, Twitter, and Instagram. I have loved getting to know Trish over the years -- and watching her girls grow. Great interview and great way to get to know her better. Ah, watching a blogger's family grow definitely builds a connection, I think anyway. Great interview! I love Trish and her blog is always so full of fascinating bits and pieces. Trish has a great variety of content! I'm glad we've been able to connect too - I've no idea how I've totally passed over her blog for so long! I love the question about choosing bookish destinations! I'm sure there have been places I've added to my travel wish list because of books -- Prague comes to mind, for sure, after reading a book about Prague during World War II. But I bet there are lots of others too! Books are a great for armchair travelling :-) All the better if you're able to visit those places too. Trish is the best - truly. And she shares those perfect pictures of her littles. Which are the cutest. And she likes Stephen King. And lives in Texas. Well, I will stop. Just go by and visit. You won't be sorry. Great job on the interview questions!!! Yes to everything you said, Kay! Awww Trish is the best. Love this! Trish is Wonder Woman! I'm glad the two of you were paired up for BBAW. A good match! Pretty much, haha! I'm glad we've been able to connect through BBAW too. Ha ha, I love that Stephen King is your comfort read. But I know exactly what you mean about feeling at home when reading him. The Princess Bride is a great pick, I actually read the book before the movie, but it is really tricky to say how the other way round will feel. Such a great interview! Great interview with Trish! I've read her blog for several years not but it was still fun learning more about her! That's great - I've learnt lots of new things about bloggers I've read for years through the interviews. Fun!